If your bucket list includes dozens of places you’d like to see but think you can’t afford to travel to, think again. All you need is an RV or Travel Trailer to get where you want to go. Worried about the expense? Don’t be. There are hundreds of options to choose from, so you can find the vehicle that will fit your style, your desires, and your budget. In 2017, the average daily stay in a hotel was more than $126 per night, but an RV or camper site at a state park can start as low as $12 per night. Think of it, you could get 10 times more vacation in an RV! And that doesn’t even count the amount of money you save when you can fix your own meals in your motor home instead of eating out in restaurants every day. There are so many advantages to renting or owning an RV. You don’t have to pack suitcases and haul luggage because all your belongings are neatly stowed and already in your room. You have your own bed, your own linens, your own space. You can travel the United States on your schedule and at your convenience. No deposit costs for traveling with your dogs. Plus, you can get up close and personal with nature, or you can park in an RV resort with the luxury amenities you want. What kind of vehicle should you get? 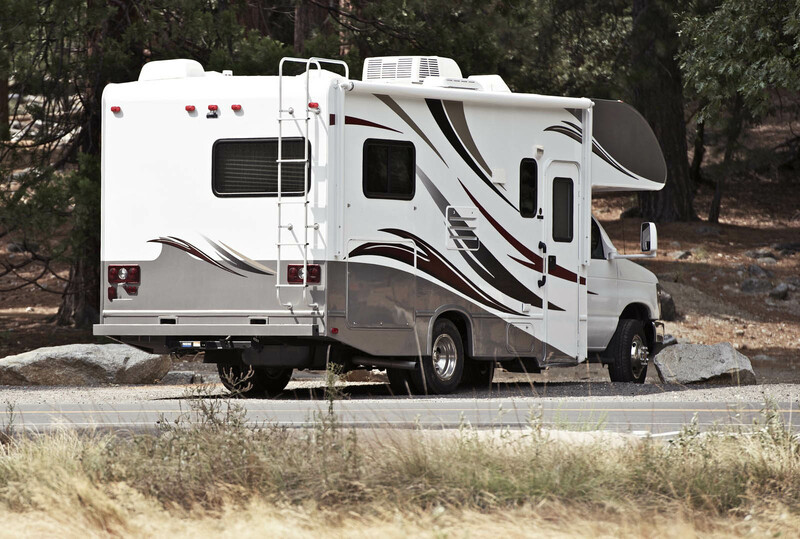 Read through our Guide to RV’s to get an idea of how convenient and cool these vehicles are. Motorhomes are he kind that you actually drive. You are not towing your living quarters. You are driving them. With one glance into your rearview mirror, you can see your room for the night. Sometimes called Motorhomes, the motorized vehicles can offer an easier drive than a tow-behind trailer. In addition, motorhomes – as the name implies – feel just like home because of the décor, the layout, and the conveniences offered. Motorhomes can be divided into four basis categories: Class A, Class B, and Class C.
Type A Motorhomes are a home on wheels. These vehicles range from 21-45 feet in length and are built on a chassis that is heavy-duty and designed for driving. Motorhomes have bedrooms, bathrooms, lounging areas, kitchens and eating areas. These gracious vehicles offer all the conveniences of home and are equipped with heating and cooling systems, good lighting, advanced electrical systems, and entertainment systems. Some come with complete laundry facilities. Class A motorhomes can have multiple slide-outs for an additional 3 feet of living space in any given area. Depending on the price, motorhomes can offer luxury finishes like woodwork, custom cabinetry, and decorator touches. Class A Motorhomes feel like home with all the modern conveniences. Hundreds of floorplans and layouts are available. Full-scale bathrooms and kitchen facilities included. Good for long-term vacations or full-time living. Because of their size, Class A Motorhomes can be difficult to maneuver in small areas. For transportation at your destination, you will have to tow a car behind you. Costly to insure and maintain. Depending on size, some states might require an additional license. 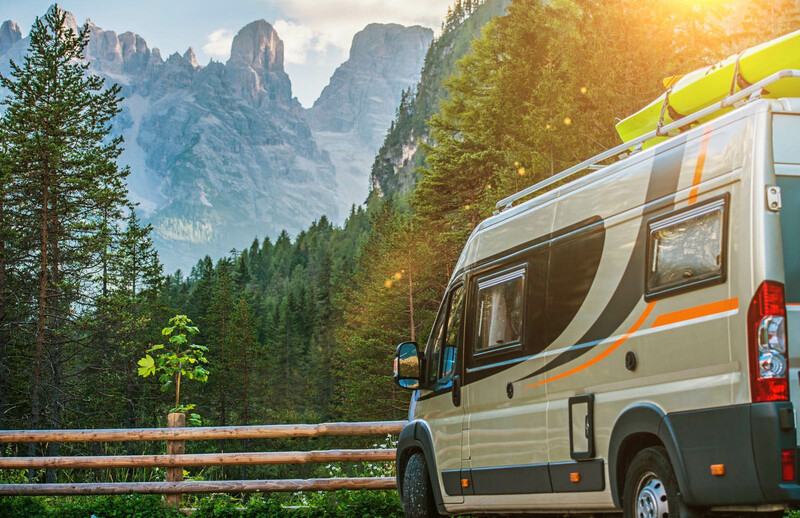 Cost to Own: If you truly love to travel, there’s nothing like owning a Class A Motorhome that can take you anywhere you want to go and still live with the comforts of home. New models range from $60,000 to $900,000, depending on size and the amount of luxury you want. Cost to Rent: Keeping in mind that the rates may be better if you rent for longer terms, the average daily price ranges between $100 and $500 per day, depending on the model. A Class B Motorhome is known as a “Camper Van” since these are vehicles which are built just like a van. Placed on a standard van chassis, these vehicles include a raised roof so that you can easily stand up inside. The accommodations are small and cozy, but Class B Motorhomes are oh-so-easy to drive. . .no different than your morning commute. Most camper vans offer modest cooking facilities, a wet bar, and a queen-sized bed. A small wet-bath, one of those shower stalls that encompasses the toilet and the sink, is a standard feature. Some efficient storage is provided in the nooks and crannies of the small van. Extremely easy to drive, park, back-up and maneuver. No need to tow an extra vehicle. No need for towing equipment of hitches, sway bars, and chains. Lower fuel costs than other Recreational Vehicles. Class B Motorhomes are expensive. Cost to Own: One of these glamorous vans, ready to go anywhere, anytime, can be yours for between $60,000 – $130,000. Easier on the budget than Class A Motorhomes and offering more space and amenities than Class B Motorhomes, Class C Motorhomes are a mid-size “driveable,” 20-35 feet long. Class C vehicles are unique in that they have an over-the-cab area that provides extra sleeping or storage areas and is part of the trailer body. Built on an extra-wide automotive van frame, Class C vehicles are also easier to drive than the larger Class A’s. Motorhomes in the Class C category have the conveniences of home, like full kitchen facilities, bathrooms, and bedroom areas. It is common for people with Class C Motorhomes to tow an additional vehicle for easy transportation after arriving at their destination. Easier to drive and navigate than Class A Motorhomes. Cost is lower than Class A’s and Class B’s. Easy to move from driving seats to a belted seat in the living areas of camper. Because of the weight of Class C Motorhomes, they are still heavy and take a lot of fuel. Difficult to maneuver in heavily trafficked areas or small parking lots. Still have to tow a vehicle for trips after arriving at camping location. Cost to Own: A Class C Motorhome will run you from $43,000 to $200,000 or more. Cost to Rent: Depending on the season, the size and age of the motorhome, and the amenities it includes, you might expect to spend between $75 and $150 per night. Keep in mind that many rentals add on an additional mileage cost. As the name declares, travel trailers or towable RV’s are transported from place to place by your car or truck. A simple hitch system safely connects the towing vehicle to the trailer. Many of today’s models are ultra-light and can be pulled by your old family car. The bigger, heavier models might require a certain size motor. Find out what the towing capacity of your vehicle is before you commit to a purchase, but don’t worry. Towable RV’s come in all shapes and sizes and include all the comforts of home including a kitchen area, sleeping and/or lounging areas, and storage space. Larger models may include a full bath and separate bedroom. 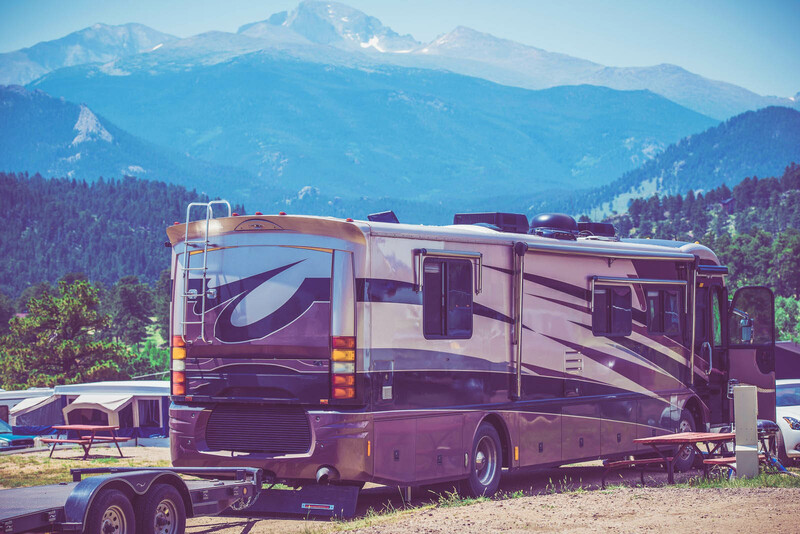 The advantage to a Towable RV is that you can unhook it from your vehicle when you arrive at your destination, giving you an efficient means of transportation. The disadvantage is that – depending on size – they can be difficult to handle in small parking areas or heavily-trafficked, narrow streets. To tow a vehicle, you must also work with a towing package that may include sway-bars, chains and pins. 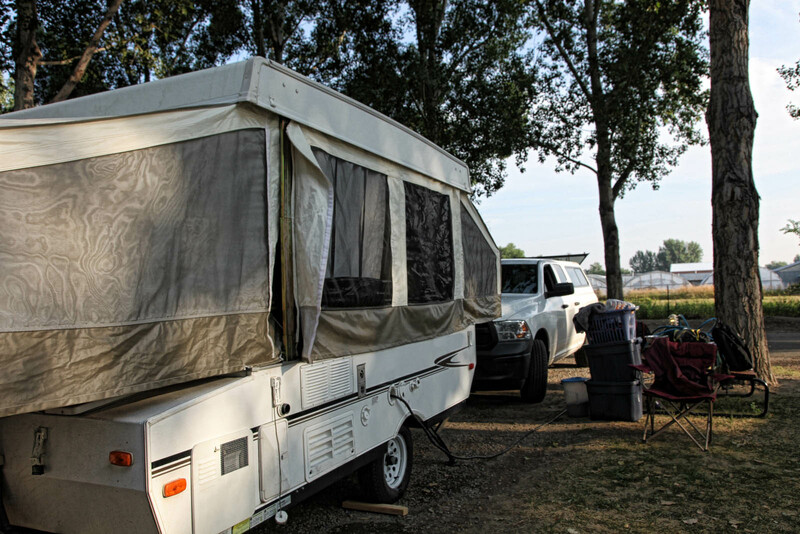 Folding Camper Trailers are often referred to as “Pop-Ups” because much of their construction is based on soft-sided, expandable, foldable sections. Think of a cross between a tent and a trailer, and you’ve got the idea of a pop-up. (Sometimes called the “Transformers” of the camping universe.) These versatile units are popular because they are inexpensive and very easy to tow. The base of the unit has a hard-body which contains the kitchen and bathroom necessities. The “bedrooms” are canvas extensions lined with screen windows. A pop-up camper allows you to sleep like you would in a tent except you are off the ground, (away from ticks, ants, and dirt), and you have many of the comforts of home. When you’re ready to move again, just fold everything up into one easy-to-maneuver, lightweight little box and go. Folding Camper Trailers are the least expensive in the towable R.V. category. They are also one of the smallest and easiest to tow models. If you truly love sleeping in the open air, a Pop-Up allows you to sleep off the ground, but still in the open air. Because these trailers have tent-like characteristics, they are not good for extreme weather like cold or storms. They fold up like a cute little origami box, so there is little or no storage. Suited for quick trips and summer vacations and not for long-term stays or cold weather. Cost to Own: Ranging from $6,000 to $22,000, pop-up campers are an easy upgrade for tent campers and affordable for a short-term occasional camper. Cost to Rent: You can rent a large, comfortable, newer Folding Camper Trailer for between $100 to $150 per day, but you can also get a smaller, older – but still extremely comfortable model – for around $60 to $80 per day. If you have a truck and like to travel, nothing is easier than a truck bed camper. Think about a turtle and how it carries its house on its back. That’s exactly what a truck camper is. It’s a unit that slides into the back of the truck bed and goes over the cab so that your truck carries your lodging with it. The units are specifically sized to fit certain vehicles, so make sure you get one that fits your truck. Truck campers are small and efficient, easy to drive, and ready to go whenever you are. Ranging from 8-20 foot- long, truck campers might also be referred to as slide-ins or cab-overs. Provide space for sleeping, cooking, and sitting. Extremely easy to drive since it’s really just driving your truck. In fact, if you’re into semantics, you could argue that truck campers aren’t really tow-behinds but sit-on-tops. Living area in a truck camper is small. Most truck campers offer pared-down accommodations. Truck campers must be made specifically for your model of truck. Cost to Own: Truck campers range in price from $6,000 to $55,000, depending on the size and the lay-out. 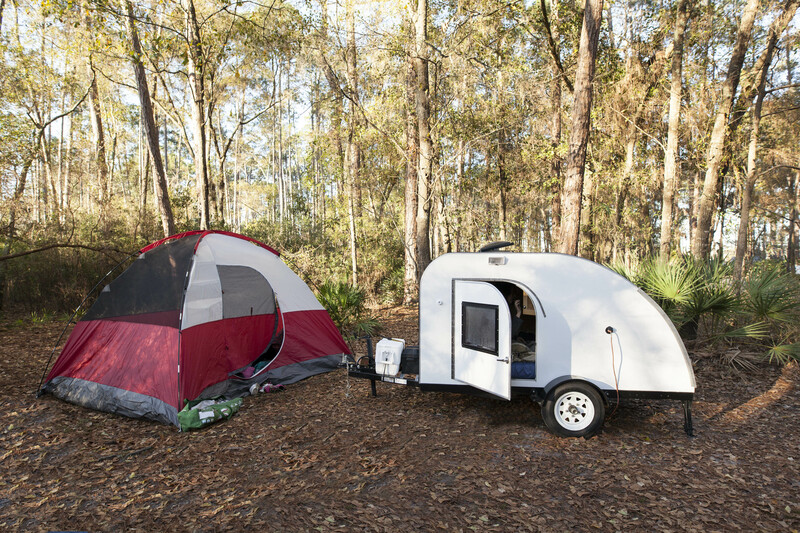 A mini camper is a lightweight, super-efficient travel trailer. These tiny gems can start as little as 4 feet long. Popular in the 1960’s, these little trailers are making a comeback because of the ease in towing, the modern designs that make them more spacious and comfortable, and the really cool retro vibes and colors that manufacturers are producing. Added features might include movable, modular seating, LED lighting, bug screens, portable water storage, and stereo systems. Mini-campers can be towed by almost any vehicle since they weigh only between 500 and 3200 pounds. The most popular and recognizable of the mini-campers is the iconic TearDrop, named for the sleek, aerodynamic shape. Teardrop campers can provide large sleeping spaces inside. Some models flaunt a large, open-up kitchen area in the back end. Extremely lightweight, mini-campers can be towed by almost any vehicle. Easy to maneuver, park, and drive. Lower fuel costs and reduced wear and tear on tow vehicle. Good sleeping space, but not much for other needs. Kitchen and cooking space usually open up from the back-end which may be a problem in bad weather. Cost to Own: A new mini-camper can run anywhere from $11,000 to $63,000 depending on the manufacturer, the aesthetics and appearance of the camper, and the number of features it includes. What happens when you cross a towable travel trailer with a “pop-up” Folding Camper? You get an Expandable Travel Trailer, usually 19 to 30 feet long. An Expandable Travel Trailer is like a regular tow-behind camper, but it has the added feature of pull-out areas for additional sleeping. These expansions often are like screened-in sleeping porches and dramatically increase the amount of living space available in the trailer. The expansions are lighter than slide-outs, enabling many Expandable Travel Trailers to be towed with a six-cylinder family vehicle. The lighter-weight of this travel trailer makes it easier to two than a traditional tow-behind. Because of its weight, it is cheaper to tow because it takes less fuel. Like other towable models, an Expandable Travel Trailer can easily be unhitched from the car, allowing the camper to stay parked while the car is in use for short excursions. Expandable Trailers are also less expensive than other models. The expansion units are soft-sided pull-outs and are not suitable for cold weather. Like any pull-behind model, you have to learn to hitch it up using sway bars, chains, and pins. Cost to Own: The price on these units is as sweet as these accommodating little houses-on-wheels themselves. You can own one for $10,000 to $30,000. Cost to Rent: Rental prices vary from agency to agency, and the cost always depends on the size, age, and condition of the vehicle. However, the cost for this model will probably range in the $100 per night range. What do you think about actually having an upper area for living in a pull-behind trailer? Awesome, right? A fifth-wheel trailer is built with a raised section toward the front that fits over a truck-bed. This extension, sometimes called a “gooseneck” connects to the truck bed and offers a safer connection and easier-to-maneuver combined vehicle and trailer. Fifth-wheels, because of their added space and bigger size, are the most expensive of the towable R.V.s, but they also offer the most stability and comfort. Many manufacturers offer luxury fifth-wheelers with premium finishes and added features. Fifth-wheels can be easier and safer to tow than travel trailers. They are also larger and offer a separate level of living space. Comfort is a key element of fifth-wheeling, and many models include a large picture window at the back, providing a scenic view of your surroundings. Because of their size, they can offer multiple slide-outs and luxurious amenities. As with travel-trailers, a fifth-wheel can be detached from the tow vehicle, freeing it up for easy transportation. To tow a heavy fifth-wheeler, you need a heavier vehicle, and you’ll need to verify that your towing capacity is up to the added weight of the fifth-wheeler. Depending on your state and the size of your fifth-wheel, you may need an extra non-commercial driver’s license. Check with your state’s Driver’s License Branch. The bigger and fancier the trailer, the more gas it takes to pull. Cost to Own: The amenities and space make the Fifth-Wheeler the most expensive of the Tow-Behind category. Costs will range from $18,000 to $160,000. Cost to Rent: The greatest thing about renting is that you can test out a trailer type and be certain what you want to own. Renting a vehicle saves on insurance, storage, and maintenance costs. The average rental on a fifth-wheel runs from $100-$240 per night, with most rentals costing $200 per night. Ah! If you have “toys” like motorcycles, bicycles, trikes, four-wheelers, kayaks, canoes, or paddleboats, you will want to own a Sport Utility RV. Commonly known as Toy-Haulers, the Sport Utility RV is a towable R.V. that provides both living space AND space for your sporting equipment, usually referred to as a garage. Load your toys into the garage area at the back of the trailer using the drop-down door that serves as a ramp. The front part of the trailer is the living quarters. Because of the garage space, the living area in a Sport Utility RV is smaller than in a traditional travel trailer, but it is still comfortable and conveniently arranged. Once your “toys” come out of the garage, you can use that space as additional living space since most come equipped with drop-down beds. Now you’ve got a second bedroom or an office or work-out space. Owning a Sports Utility Vehicles, or Toy Haulers, keeps you from having to tow an additional vehicle. Toy Haulers have large D-Rings anchored in the floor so that you can strap your equipment into place. These RV’s provide a comfortable living area, including bathroom and kitchen facilities in addition to space for transporting recreational vehicles. Like other towables, they are affordable and can be unhitched so that you have your vehicle available for short trips. Because of their size, Sport Utility Vehicles can be hard to navigate and hard to back-up. Since you are also hauling heavy equipment inside your trailer, you have to make sure your vehicle is up to the task. Fuel prices go up because of the added weight of the equipment that you haul inside your Sport Utility Trailer. Living quarters are a condensed version of the standard travel trailer with less floor space and compact floor-plan. Cost to Own: You get a lot of bang for your buck with a Toy Hauler, this dual-purpose travel trailer. Costs range from $10,300 to $170,000, again depending on size and amenities. Cost to Rent: You can rent a Toy Hauler, usually for between $100 and $200 per night. Like all rates, the cost to rent will depend on the time of year, availability, size, and options included. When It’s Time to Go When You’re On the Go: We all do it, and if you’re camping near a dark forest in the middle of the night, you might not want to wake up and walk outside to go to the bathroom. Traveling has never been easier than it is now when you own a R.V. Even the smallest models can offer facilities for when you have to go when you’re on the go. In some instances, a small trailer will include a room that has a toilet, sink, and showerhead. The entire room functions as a shower stall in a design called a “wet bath.” Other models do include a separate shower. Lots of options exist for living small and still having bathroom facilities. Mini-campers between 11-22 feet long offer many options including outdoor showers, dry flush toilets, and water heaters. Of course, where there’s a bathroom, there is a need for other options, like vent fans and windows, both of which are available. No matter what you like to do, there is an RV that is designed specifically for you and your interests. If you have special needs, go to horse competitions, or love ice-fishing, there is a camper just waiting for you. Don’t wait to enjoy life. Rent or buy the vehicle of your choice now. Recreational vehicles offer special ramps, wheelchair lifts, wheel-under sinks, and lower counters and cabinets to accommodate your needs. Certain manufacturers specialize in modifications. It’s not just the horses who travel in luxury! Horse trailers can be as long as 51 feet and accommodate up to eight horses and four adults. Each horse can travel in secure stall while their human caretakers have their own nearby accommodations. The living area in horse trailers includes entertainment area, kitchen, bedroom, and bathroom. In addition, horse trailers understand the need for storage space for gear, feed, and tack, plus competition clothes and all the needs of daily living. If you travel for extended periods with your horses, you can save money by lodging in your horse trailer and cooking your meals, however you like them, whenever you want. You can be near your horses, caring for them and watching over them. Comforts of home for you and your horses. May be big and difficult to drive. Expensive to fuel and insure. Cost to Own: The price of this specialized niche recreational vehicle ranges from $20,000 to $200,000. Cost to Rent: Because this is a very specialized vehicle, they are not usually available for rent. If you love to ice-fish, then you need to consider owning your own RV that can take you out onto the house as often as you’d like to go. These specialty Ice-Fishing Houses range from 6-30 feet long and can seat 2-6 cold-weather-loving fishermen. Choose the level of comfort you’d like to have while you dip your poles through the holes. Accommodations range from fundamental shelter from the elements with bench seats all the way to larger structures offering more comfort: heat, kitchens, beds, satellite television. Can be pulled onto the ice with an ATV. Provides shelter from the elements. May provide comfort in the form of cooking facilities, beds, and television. The added comforts of heat and accommodations add to the price. You can only use this if you’re an avid outdoorsman and ice-fishing enthusiast. Cost to Own: You can own an Ice-Fishing House for between $3,000 to $20,000. Going somewhere for an entire season? Are you thinking of buying a second home? Consider a Park Model RV. These are beautiful, movable, towable RV’s designed to look like a house, with windows, siding, and porches. Providing about 400 square feet of living space, these trailers are usually set up in a spot for an extended time. They hook up to sewer, electricity, and water just like a typical RV. The appearance of a Park Model provides curb appeal and a sense of home. These models look just like a small home with designer flair. Park Model RV’s provide extra living space with the addition of porches and steps. Often include a sleeping loft on an upper level. Too big to easily drive, Camp Model RVs are usually towed to a Seasonal campground or RV Resort for long-term stays. Cost to Own: A beautiful Park Model RV can be yours for $20,000 – $80,000. The most common type of Towable RV, a conventional travel trailer comes in all sizes, from 4 feet to 35 feet long. The size you choose will determine what amenities come standard. Hundreds of different configurations and layouts are possible. One really cool element of some travel trailers is an option for slide-outs. A slide-out is a wall of the trailer that moves outward once the vehicle is parked. Slides-outs became standard equipment in 1999, and many towable R.V.s now have multiple slides outs. The advantage to a trailer with slide-outs is that living space is dramatically increased, making your trailer more like an apartment. A dining nook can be slid out with the flip of a switch to add an extra three feet of floor space. A bedroom can be rolled out to allow space to walk around the bed. So many possibilities for gracious living all as easy as turning on a light switch! Travel trailers are less expensive that motor homes and accommodate any living and travel need you might have. Sizes, floor plans, and amenities vary greatly, and you can choose whatever design fits your desires. They offer comfort on a budget you can afford. One of the biggest advantages to travel trailers is that they can be unhitched from your vehicle, freeing up your car or truck for sightseeing, grocery shopping, or short excursions. Towing the trailer isn’t hard, but you do have to have adequate power in your vehicle. Slide-outs are a great feature, but they do add weight and cost to the trailer. Slide-outs might – on rare occasions – lend themselves to developing leaks. The larger the model, the more difficult it can be to maneuver. Cost to Own: A Towable RV or Travel Trailer runs from $8,000 to $95,000, again depending on size, amenities, and number of slide-outs. Cost to Rent: If you’d like to try a travel-trailer instead of owning one, you can easily do so. The prices to rent span a wide range. Renting a smaller, older model with fewer features can run as low as $30.00 a night. Larger, fancier models might rent for $140 a night.